If something goes wrong with your LG refrigerator, you want it fixed fast. But, it’s not always easy for the average homeowner to tell exactly what the problem is. Fortunately, there are some clear warning signs that will make it easier to know when to call for repair. 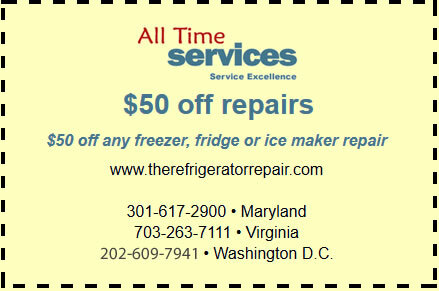 If you live in the greater Washington D.C. area, know that All Time Services is here to provide expert LG refrigerator repair services in Maryland, Virginia and Gaithersburg whenever you need them. From a pool of water behind your fridge to a door that has trouble sealing shut, call us for all of your LG fridge repair needs. If any of these problems occurs, you probably need repair services. And while the problem may not seem severe, any one of these symptoms can be a sign of multiple problems. It may only be a missing door spacer, or it could be a compressor about to break. The earlier you call, the quicker you can get your LG refrigerator repaired and hopefully avert a complete breakdown – something that could lead to replacement and much larger expenses. We offer a full range of repair services, from routine part replacements to emergency repairs when your LG refrigerator stops working completely. Whether you suspect a broken thermostat, worn out motor or a damaged compressor, we can help. We also provide expert services for all LG ice makers and freezer compartments. When it comes time to call in an expert for your LG refrigerator problems, contact All Time Services. 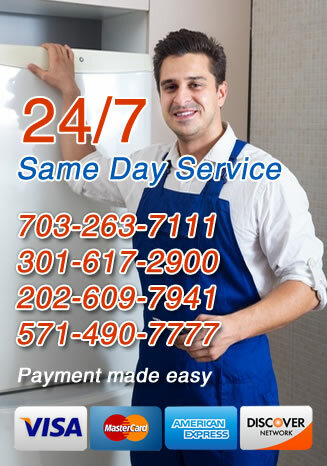 We offer professional LG fridge repair services in Arlington, Virginia, Gaithersburg, Maryland and the Washington DC surrounding areas. Call us today to learn more about what we can do for you.